Global Down Syndrome Foundation builds a legacy that only begins with construction. Nothing in life is more personal than life itself and how we live will largely define what it is that we leave behind. Architecture, of course, provides an indelible monument to a moment in time framing a point of purpose. Yet, a building by itself doesn’t amount to a legacy. It is what happens between the bricks and sticks, the steel and concrete, when the design is done, and the users own their space, that marks the true measure of a building. 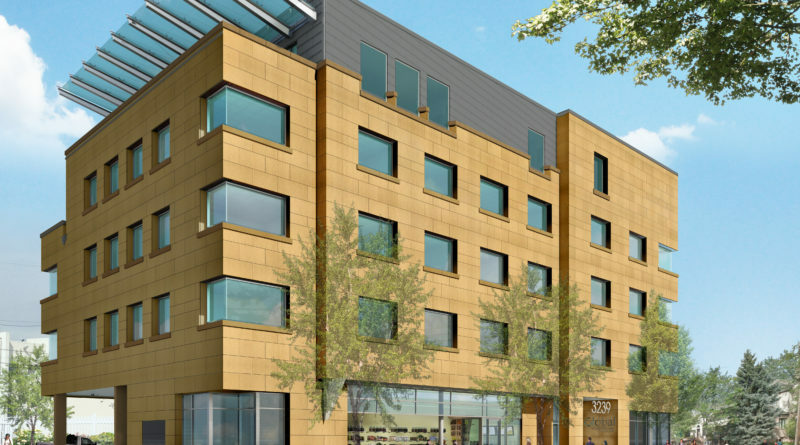 For the Global Down Syndrome Foundation, the process and promise of completing their new headquarters at 2nd and Adams in Denver’s Cherry Creek North neighborhood is a dream come true. Michelle Sie Whitten is President, and CEO of the Global Down Syndrome Foundation, which she co-founded in 2009. Initially following in her father’s footsteps, Whitten’s experience in the business world includes contributing to the Sie family’s legacy in cable television where her father was a true pioneer. John J. Sie, a Chinese immigrant, helped build the Showtime Network along with the Starz and Encore channels. After more than 15 years in the private sector, Whitten turned her attention instead to something close to her heart. Envisioning the Foundation’s headquarters as a heart of the Down Syndrome community, Whitten’s expectation is that the new facility will allow her team to focus on its mission of improving the lives of individuals with Down syndrome through research, medical care, education, advocacy, and, of course, raising the critical funding to support this mission. The 35,000-SF, five-story office building will also facilitate one-on-one interaction among scientists and medical professionals and people touched by Down syndrome. It will also greatly enhance established partnerships with the Linda Crnic Institute for Down Syndrome and the Rocky Mountain Alzheimer’s Disease Center both on the Anschutz Medical Campus at the University of Colorado, and the Sie Center for Down Syndrome at Children’s Hospital Colorado, among a growing list of entities worldwide. After more than four years of planning, the task of delivering the building fell to architects Saiber Saiber and general contractor GH Phipps. 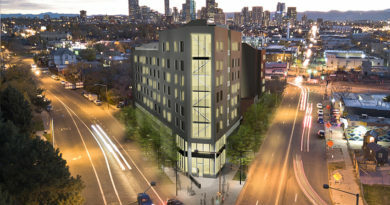 “Owner-occupied new construction with an altruistic purpose on a parcel in my neighborhood, this building quickly approaches an ultimate project for any architect,” says Jonathan Saiber, a designer of more than 50 years’ experience and a Cherry Creek North resident. The four-story professional plan for the building includes traditional closed-plan offices and conference space to house the Foundation’s office staff along with an educational center on level one, a fitness center, library, coffee shop, and structured parking. Saiber Saiber Architecture has been involved in numerous mixed-use developments in the District and shared a special pride in being selected for the commission. “The experience of learning about this community and designing for them was really something of an unexpected dividend for me personally,” says Saiber. The Education Center will help those with Down Syndrome to develop physical and interpersonal skills to achieve more independence and have healthier longer lives. It will also serve as a focal point of natural, non-clinical engagement between those who study it and those who have it. As functionality shifts on level two, the Foundation’s typically-abled staff composed of empathetic, socially-aware professionals will do the Foundation’s work. Interconnectivity between people working toward different programmatic goals – research, outreach, education, empowerment – was essential to Whitten’s vision for a shared-purpose workspace. Glass wall, store-front partitioning will keep office occupants connected to the primary circulation plan on each floor. Embodying the concept of interconnectivity both literally and figuratively is the building’s open oval and grand stair connecting the primary level two and three office areas. Level four is shared with the Anna and John J. Sie Foundation and AJS Ventures, and where the Global Down Syndrome Foundation’s vision will find its fuel, the place where Whitten and her team will do the hard work that happens to be fun. Raising awareness and support through fundraising and donor-centric initiatives is a constant critical for any non-profit organization and Global hopes floor four’s positive impression will make an impact on the bottom line. A large boardroom framed in glass and backed by city views looks out over the oldest part of the neighborhood’s single-family homes to the north. 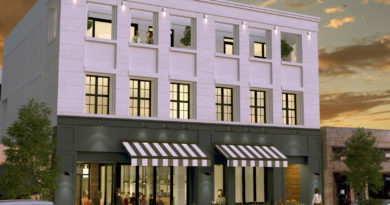 A long, wide commercial rooftop terrace stretches the length of the building and will connect to a point of service bar and catering kitchen on the same level. GH Phipps Project Manager, Adam Tormohlen, led the firm’s project delivery and like Saiber, finds tremendous personal reward in being involved. Delivering a zero-lot-line project means building literally to the property line and working at the delicate edge where mixed-use and residential meet increases complexity. 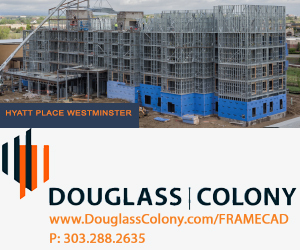 Careful crane placement for reach without encroachment; egress and staging for large equipment; and hauling large quantities of dirt, concrete quietly and efficiently through Cherry Creek North all require a certain finesse. Within the site once the moment the substructure is placed until the overall building form is established and mechanical equipment is installed construction activity is a closely choreographed ballet. Tormohlen suggests that just-in-time delivery strategies for equipment and material deliveries keep the project energized as construction races toward completion for the soft opening in June 2018. Whitten and her parents, Anna and John J. Sie, eagerly await the completed vision for the building and see it as a firm foothold in their ultimate goal.